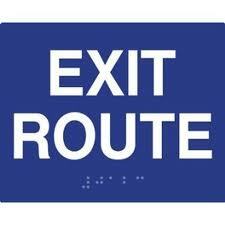 Exit Route – Exercise Your Choice! John is on his way to the office one morning. He gets on the 3 lane interstate. In another 2 miles, he would need to take the exit toward his office. He notices that the right most lane is cordoned off a long way since there is some construction activity in progress in that section of the interstate. The other 2 lanes to the left seem congested with all the out flowing traffic. The inner lane is moving slow while the outer lane is somewhat fluid. Since its only 2 miles to your exit, you could stick to the inner lane and drift with the traffic until you reach your exit. Between your exit and where you currently are is an intermediate exit that has incoming traffic flowing onto the interstate which could be reason for further congestion and slow moving traffic. 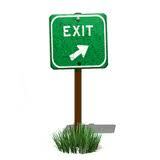 It might take a little longer, not sure how long, but you will get to your exit eventually. Perhaps, the safest option in this congested state. Another option is to watch for an opportunity and get on the outer lane which has traffic moving a bit more fluidly. You would need to be alert and cautious as you move through this lane and eventually shift to the right lane when you get closer to your exit. You need to be watchful of finding that opportunity and space between the trail of vehicles on your right in time, to not move over too soon to get stuck in the slow moving lane and not too late to miss your exit. At the same time, you need to be careful of not causing an accident in this already congested traffic. Why am I going through this; about something as simple as driving on an interstate which we tend to do subconsciously everyday. This simple task translates into something as profound as managing your career or even your entrepreneurial venture! It’s amazing how closely our day to day lives reflect lessons that can be applied to our actions in canvases larger than us. In everything you do, whether being on the job and seeking to be successful at it or pursuing success in a project taken up or an enterprise you set up, risk in an integral part. What determines the level of your success is the amount of risk you take and come away managing it skillfully. In the example given above, John has the less risky option of just being in the inner lane and following the traffic to reach his exit while he watches to maintain his distance between the vehicles in the front and back, but the pace of movement is totally dependent on the traffic in that lane. John has no control on that pace. If the traffic sits for an hour before he inches towards his exit, that is what it is. On the other end, he takes a risk by getting into the outer lane. While he has to watch out for the vehicles in the front and rear as he maintains his position and moves along, he also needs to be watchful of the traffic in his right lane to judge where he is in relation to his oncoming exit. He needs to make the correct judgment about moving into the traffic in the right lane. Entering too soon or too late would defeat his purpose. Although, there is a little risk and the need for being more alert in the second option, it would be the ideal one for John if his goal is to reach his exit sooner than later. The time saved by not being stuck in the traffic might be well worth it, but needs some quick decisions and deft execution by John to make it possible. Of course, there are unknown risks, one of which is an accident upfront, which could slow down the outer lane too. In such cases, John would need to look for other options or go with the one that works best in the situation. Similarly, in our lives and in everything that we do in our careers as employees or as entrepreneurs, there are options. You need to determine what the end goal is and based on that, make assessment of what path to choose to get there. Risk is inevitable in every thing you do. You can take the risk averse option but, be prepared to not be in control and do not expect much to happen or you can decide to take a calculated risk which with some ingenuity and exertion on your part can ensure you great success! What kind of a person are you? The one who takes the inner lane and lets the traffic determine when you reach your exit or the one who gets on the adventure of the outer lane and makes it happen while pulsating with the excitement of controlling your journey to the exit! This entry was posted in Business and tagged career, congest, entrepreneur, exit, fluid, interstate, lane, option, project, route, success, traffic by Rajeev Mudumba. Bookmark the permalink. Thanks for the update, Kathleen. Tell me how you can help me.